The State Bar of California has been working more aggressively to investigate and prevent legal scams that target immigrants desperate to avoid deportation. Its efforts have come at a time in which the federal government, under the Trump administration, has ratcheted up its immigration enforcement activities and rhetoric. Robin Schwab told a local Hungarian immigrant named Magdolna Gulyas that she was a lawyer who could help get Gulyas’ husband released from ICE custody amid his active deportation order. Gulyas, who also had been ordered removed from the United States, paid Schwab slightly more than $3,000 last year for legal help in tandem with another attorney in San Diego County. But Schwab, who was not a licensed lawyer or working with one, did nothing to help free Gulyas’ husband Krisztian Harasztosi from detention, said San Diego Deputy District Gina Darvas. Harasztosi was ultimately deported, and Gulyas returned to Hungary as well, Darvas said. Meanwhile, Schwab pleaded guilty earlier this year to grand theft of personal property in San Diego County Superior Court. She was sentenced in August to eight months in jail on that count, as well another three years of jail for crimes unrelated to the immigration scam. The Schwab case is emblematic of the type of fraud perpetrated against immigrants by non-attorneys – and sometimes real attorneys – that the State Bar of California has been working more aggressively to investigate and prevent. Its efforts have come at a time in which the federal government, under the Trump administration, has ratcheted up its immigration enforcement activities and rhetoric. The bar has established a 14-person unit focused on investigating the unauthorized practice of law. Though the bar cannot itself prosecute non-attorneys who practice illegally, it can refer complaints to law enforcement for possible criminal prosecution. The agency has done so much more frequently in recent years. The bar only referred 10 unauthorized practice complaints in 2015, but it sent along 443 and 315 to law enforcement in 2016 and 2017, respectively. In the first nine months of 2018, the bar has already surpassed last year’s total, making 356 law enforcement referrals. The uptick beginning in 2016 came amid reports in the Los Angeles Daily Journal revealing the bar had let hundreds of unauthorized practice complaints sit in drawers for months without being investigated. The agency also started making referrals to law enforcement concurrent with ongoing internal reviews — not after they were completed — in hopes of expediting criminal investigations. The number of complaints to the bar about unauthorized practice have steadily increased in recent years. The agency received 668 last year, a 15 percent bump from two years prior. Through Sept. 30 of this year, roughly 19 percent of the 567 complaints the bar received were immigration-related. San Diego County generated 22 of the complaints this year, third among California counties. Ten of the San Diego complaints were referred to law enforcement, the bar reported. Steve Walker, a spokesman for the DA, said a quick review indicated no bar referrals to the office’s special operations division had resulted in prosecutions since the start of 2017. The DA’s economic crimes division, which handled the Schwab case, typically gets referrals from ICE anti-fraud agents. Andrew Nietor, an immigration attorney in San Diego, said unauthorized practice of law tends to spike when immigrants feel most vulnerable about their futures. “I would not be surprised if there are more people trying to prey on this community because there is a heightened degree of desperation,” Nietor said. Indeed, one of the alerts the bar issued this year warning immigrants seeking legal help to be wary of potential fraud was sent in late July, as families were being separated at the border. Besides referring complaints to law enforcement, the bar can file petitions in superior court for the court to take over control of a law practice illegally being operated by a non-lawyer. If a request is granted, the bar acts under direction of the court to wind down the practice to prevent further fraud and assist victims. The bar has filed five such requests so far this year, and they all have been granted, said bar spokeswoman Rebecca Farmer. In May, the bar obtained an order from Los Angeles County Superior Court allowing the agency to seize client documents and files from an illegal law practice in Lynwood. Jessica Godoy Ramos solicited clients to represent in immigration matters and collected fees while pretending to be licensed in New York, the bar said. Ramos, who has never been licensed to practice in any state, misled about 80 clients. She was sentenced to 15 months in prison earlier this year after pleading guilty to one count of mail fraud. In January, the bar obtained an order in cooperation with the California attorney general office’s to take jurisdiction of an unlicensed law practice in the Stockton area. Yehlen Dorothea Brooks had previously been a licensed lawyer in Kansas, which allowed her to practice in immigration courts, but she was disbarred in 2015. She unlawfully continued to take immigrant clients after that, according to the bar. “Some clients, including those who paid her based on her assurances that she would protect them, were detained and deported anyway,” the bar said in a press release. Brooks pleaded guilty last December to 15 felony counts of grand theft for defrauding immigrant clients seeking citizenship, and the attorney general’s office said she was given a five-year split sentence to be served locally. She was also ordered to pay $371,709 in restitution. Assemblywoman Lorena Gonzalez, a San Diego Democrat, has been a leading legislative voice advocating for the bar to aggressively investigate the unauthorized practice of law in the immigrant community. She told Voice of San Diego she was pleased to see the bar take seriously lawmakers’ concerns about the agency’s past lackluster efforts. “We have a new regime who has committed to be more responsive on this issue, and I think that they have been,” Gonzalez said. Work to prevent non-attorneys from taking advantage of immigrants and making mistakes on their behalf is needed more than ever, she said, amid the Trump administration’s crackdown. Gonzalez was the author of a 2013 law that banned non-attorneys from using the word “notario” in advertising. The law aims to prevent immigrants from being confused by people who aren’t actually authorized to practice law. Violators are subject to a civil penalty of up to $1,000 a day for each violation, which can be assessed and collected through a civil action brought by the bar. The bar sought penalties in the first notario law case it filed in 2016, but the court did not approve them, the bar’s spokeswoman said. The agency hasn’t filed any cases since then, Farmer said. For her part, Gonzalez said she has seen the term notario used far less in her district since the law’s passage, which she called a positive trend. She also noted that while the focus of her previous legislative efforts in the unlicensed practice realm were driven by a goal of protecting immigrants optimistic about potential federal reforms, she will craft future proposals with a different lens. One area she said is ripe for further legislative debate is the power afforded to immigration consultants in California. A bill Gonzalez supported that would have made major changes to the industry, AB 638, died in the state Senate in August. As for the bar, it has also focused its attention on proactively educating immigrants in need of legal assistance to prevent them from falling prey to non-attorneys, such as immigration consultants. The consultants are permitted to help consumers fill out paperwork and submit forms to government agencies, but they cannot provide legal advice or represent anyone in immigration court. Earlier this year, bar staff spoke with detainees at the Adelanto ICE Processing Center about their experiences with attorneys and non-attorneys who helped them with immigration matters. Detainees at the facility roughly 85 miles northeast of Los Angeles, which was recently the subject of a scathing federal audit, were provided with attorney and non-attorney complaint forms in six languages, according to the bar. Citizenship is not required to file a complaint, and the bar will not ask about immigration or citizenship status. 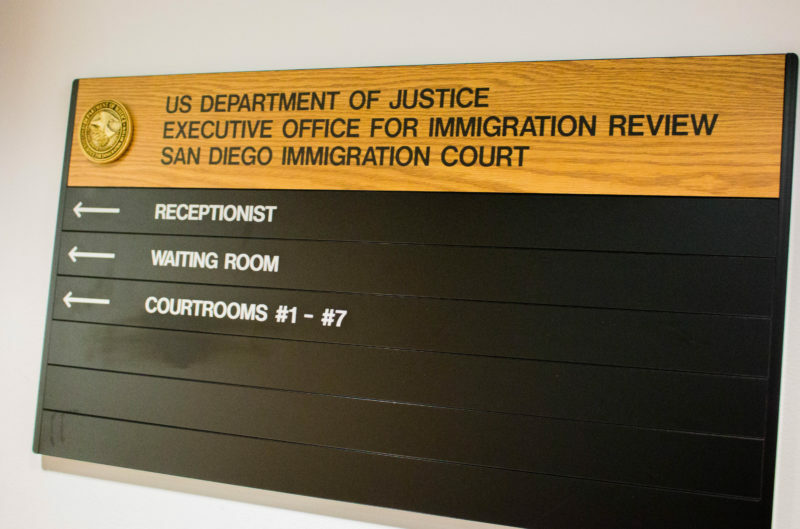 Darvas, of the San Diego DA’s economic crimes division, said her office also does not turn over undocumented crime victims to immigration authorities. Lyle Moran is a Voice of San Diego contributor. He previously reported for the Los Angeles Daily Journal and San Diego Daily Transcript. You can reach him at lmoransun@gmail.com and find him on Twitter @lylemoran.